What is life like at the sanctuary? 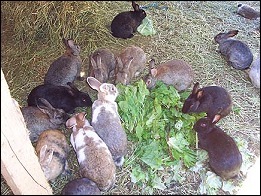 Rabbits at the sanctuary are able to live naturally in family groups. They do not have to dodge cars, or run from coyotes, or dodge hawks and owls. They are well fed and happy and have a much longer average life than they did on their own outside of the sanctuary. What is a feral rabbit? The Sanctuary at Rabbit Meadows houses only feral rabbits. These are the offspring of domestic rabbits who were abandoned when they were no longer wanted. The offspring (and their offspring and their offspring etc.) have had little or no human contact and are considered feral. The original dumped rabbits are not feral, even if they are unsocialized. What if a rabbit gets sick? When any of the feral rabbits need to be picked up and checked for a medical problem, you can see how this can be easily accomplished. Since the feral rabbits will take food (especially fruit) directly from attendants' hands, they can just be "snatched" up and examined or monitored for a day or two to determine if vet care is needed. The liver coccidia that many of them came with has been totally eliminated. What do the rabbits eat? These rabbits are cautiously sharing an apple. Just like kids, fruit is much tastier than veggies. They often enjoy watermelon, strawberries, apples, bananas, pears, mangos, etc. In addition, we feed these rabbits ten bales of alfalfa each week and several cases of veggies each day. Our rabbits use lots of bales of straw to keep warm. Or use the Pay-Pal button at right to make a safe and easy on-line contribution. Rabbit Meadows consists of an out side Sanctuary for feral rabbits and a Shelter/Adoption building for adoptable rabbits. Over 1,500 rescued feral rabbits have roamed the 4.5 acres of Rabbit Meadows Sanctuary since we opened in 1996. Our first rescue mission was at a business park in Redmond where we saved 650 feral rabbits from the ultimate fate of the arriving bulldozers. We've subsequently rescued feral rabbit populations from Rocky Reach Dam in Wenatchee, Seattle's Woodland Park, and the Aqua Barn of Kent, insuring each rabbit a safe haven to live out the rest of their life at Rabbit meadows without threat of harm. Today, Rabbit Meadows shows definite signs of age, wear and tear from weather and badly needs an upgrade. To accommodate the sanctuary rabbits, our adoption center and our compassionate human visitors, Rabbit Meadows will be building a new Shelter among the picturesque trees on its grounds. Initially there will be one main building at the end of a winding driveway. Our beautiful trees will be left undisturbed so that our resident wildlife (raccoons, deer, owls, cottontail rabbits, etc.) who feel comfortable returning to Rabbit Meadows each year, will continue to do so. We need your support to accomplish this project. Please help us to continue to give each rescued animal a safe environment and a second chance for a new home. If you would like to contribute to this effort and to our continuing rescue work, please send a donation today! In 1996, The Best Little Rabbit Rodent and Ferret House opened it's doors to the public as a shelter and a retail store with ALL proceeds going to support the shelter animals. BLRRFH had its start in 1988 when Duster came to live with our founder, Sandi Ackerman. By the end of 1988 one rabbit from a pet store had grown into 16 rescued rabbits. People were learning there was a place where they could take their unwanted rabbits. In 1988 the Washington State Chapter of the national House Rabbit Society was founded. 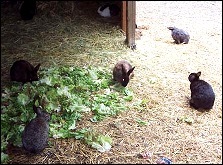 In 1996 Rabbit Meadows Feral Rabbit Sanctuary was founded with the rescue of one hundred rabbits from a Redmond business park. 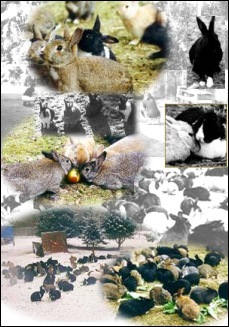 In 1997-1998, our organization joined with other groups to rescue the remaining 652 rabbits at the business park. Since then we have become the organization to look to when there have been problem areas where feral rabbits are living. Rabbit Meadows is fenced in a way that the rabbits can not escape by tunneling, and predators can not dig in. Netting is overhead to prevent predator birds from entering. Since founding, Rabbit Meadows Sanctuary has continuously provided a safe and healthy environment for numerous feral rabbit colonies. The rabbits have a "living yard," where they have tunnels and structures that provide shelter, and where they are fed. They also have a "play yard" where they can munch on plants and grass and run to their hearts' content. Running the sanctuary takes a considerable amount of time, effort and money. Although the rabbits live in a natural way, they must still be fed and have their medical needs taken care of. However, we believe that all rabbits, regardless of temperament or affinity for humans, deserve to live out their lives free from fear, pain, hunger and emotional or physical suffering. At Rabbit Meadows Sanctuary, they are doing exactly that. If you would like to contribute to the rescue effort, please send a donation today!